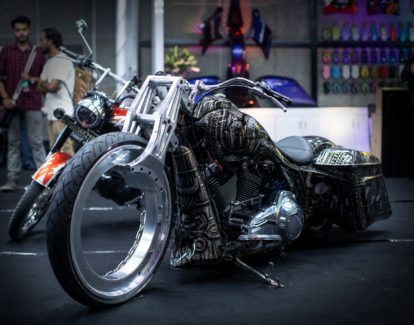 New Delhi, May, 2018 – Detailing Devils, a globally recognized auto detailing company, recently hosted the first ever Moto Craft Fest in India. 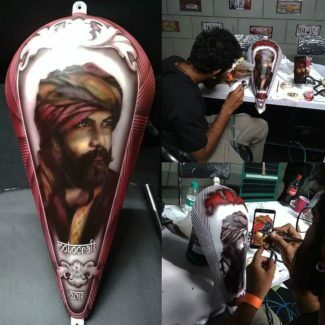 It was an initiative by LumiLor India (powered by Detailing Devils Pvt Ltd.) to promote Custom Artwork for the automotive industry in the country. The art extravaganza, which took place on the 12th and 13thof May, 2018 at Noida Studio, Sector 1, showcased the work of over 100 artists from the country. The main attraction of the Moto Craft Fest was the “Paint and Create” competition for young enthusiasts and artists, giving them an opportunity to showcase their innovative designs and creativity. Mr Pete Dedus COO, LumiLor USA judged the competition and awarded Ms. Nisha Verma,from Delhi, a freelancer artist who has worked in prop tiger, indus valley, etc as the winner of the competition. She was facilitated with a cash prize of INR Rs 1 Lac along with an opportunity to get training from the Lumilor Academy. The competition also declared Mr. Veeraj Patil from Maharashtra and Mr. Narendra Kumar from Hapur, Uttar Pradesh as the First and Second Runner-up respectively. Mr Shawn Mastrian CEO Lumilor, also addressed the august gallery with his experience about organsizing the Fest for the first time in India and the potential he foresees in the Indian Market. Other attractions included, the Knight Ride from Detailing Devils Noida Studio that grabbed eyeballs of the audience. To add more, guests were also excited about Devils Air- India’s first air piston based suspension system. The launch of Custom Made Beggar- The Bad Boi and Curtain Raiser for the LumiLor Academy were also the talk of the town. Detailing Devils is a globally recognized auto detailing company, with its headquarters in Singapore. With industry-leading standards, Detailing Devils specializes in vehicle restoration and paint protection services by making use of the frontline nano tech coatings, developed and tested in the US. Premium services, great customer service, friendly employees and a perfectly detailed vehicle! That’s what you can expect when you visit any of our locations. Offering everything from the basic exterior wash to a complete detailed job inside and out, we have something for everyone. LumiLor is India’s first four layer Light Emitting Coating (LEC) system which allows anything coated with it to illuminate.LumiLor is applied using a professional high volume / low pressure (HVLP) paint system. It’s four layer coating system includes unique processes and specifications.Three to five hours is needed to apply all of the layers of LumiLor in standard conditions.